The groundhog, famous as the weather predictor on Groundhog Day, is also called a woodchuck. It is shaped like a beaver but is smaller and has a short tail, short stout legs and very big front teeth. The woodchuck eats dandelions, clover, weeds and other kinds of vegetation - they don't chuck or eat wood! They eat all day long during warm weather to build up fat in their bodies to survive the long cold winter. A mother woodchuck has three to six babies, each 4 inches long and weighing about 1 ounce. The babies are usually born in April in a burrow. They have no fur and their eyes are shut. By six weeks of age, the youngsters are fully furred, eyes open and ready to live on their own. 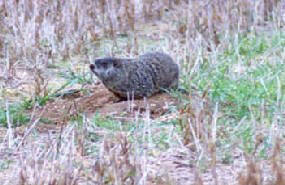 Woodchucks dig their burrows in open areas at a woodland edge, such as a pasture, a meadow or a golf course. Other animals, including skunks and foxes, may use the woodchuck's excellently dug burrows. Woodchucks dive headfirst into their burrows when they are in danger. If cornered, they will hiss and growl. They often stand on their hind legs to check for trouble. If the woodchuck sees a predator, he may give a very loud whistle. In early November, woodchucks enter their burrows, block the entrance, curl up into a ball and hibernate. During this deep sleep, their heart beat slows from about 80 beats a minute to 4 beats a minute. Their body temperature drops to as low as 37 degrees -- just a little above freezing. The woodchuck emerges from his burrow in February or March -- but he really can not forecast when Spring will start. A woodchuck's teeth grow continuously. He keeps them ground down by eating coarse food like stems, twigs and small branches. Woodchucks can swim and climb trees, although they prefer to stay on the ground.